Mini Modern: Bodensee by Bodo Hennig--Where Are You? Bodensee by Bodo Hennig--Where Are You? 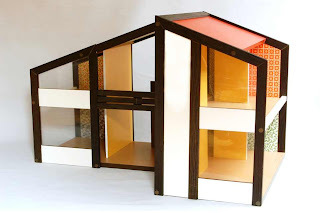 Another modern designed dollhouse from 1981 that needs to come home with me. It's quite large at 37"x24"x23". I love all the retro print and colors on the walls, appreciate the glazing and the staircase is fabulous! Where can I find this beauty? Well, with any luck, it will show up on eBay..maybe on Craigslist or at a local garage sale. See more images via the Puppenhaus Museum. If anyone has more information about this dollhouse, please comment. Keep a search on eBay Germany if you're not already - and remember it's a 1/10th scale house which is why it's big. Yes, please do send the scans. Thanks! Thanks! I already updated the home site but had forgotten to update this post. I have a Bodensee - will be blogging about it very soon. I found it on UK ebay, luckily listed by a wonderful seller who was prepared to work out how to ship it to Australia. It cost heaps, but I love it. All the furniture came from German ebay, though. Gasp! You are so lucky!